“The central power-dynamic itself — teacher seems superhuman then is revealed to be a normal human — is, well, boring. 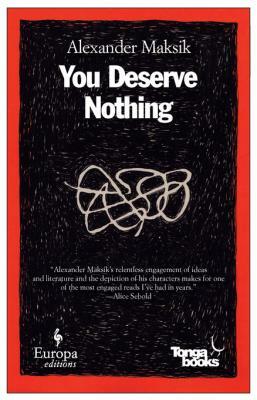 But that makes it all the more amazing when Maksik somehow pulls it off.” At Full Stop, Scott Beauchamp reviews Alexander Maksik’s You Deserve Nothing. Jeffrey Wasserstrom on the works of writer Yu Hua. R. Crumb’s album artwork has been collected. Gabrielle Gantz on Steve Almond’s recent reading at Greenlight. At Book Riot, Liberty Hardy on alternative methods of bookshelf organization. Jon Reiss looks at Brooklyn’s best coffee shops for getting work done. Jessica Hopper profiles St. Vincent for The Village Voice.